Parent Tether from Childharness.ca. 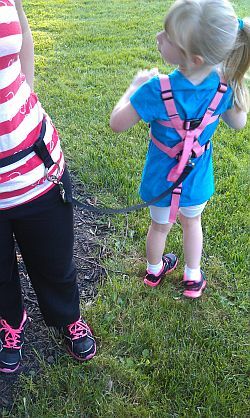 Parent waist belt tether to use with Special Needs Safety Harness from childharness.ca. 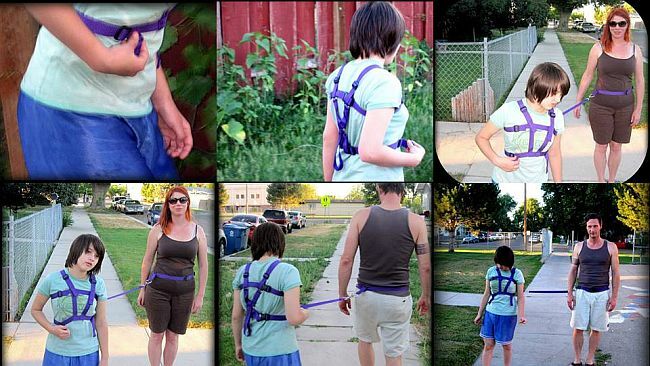 The hands-free parent-to-child tether connects you to your child so you can have your hands free but still safely "hold" onto your child. This is particularly useful when pushing a stroller with a younger sibling, or in crowded locations such as parking lots, malls and theme parks. The waist belt for the parent has an O-ring on it that can easily move along the belt. The 2 1/2 foot tether between you and your child has a heavy duty snap hook at each end. Attach one snap hook to the O-ring on your belt and the other snap hook to the O-ring at the back of the Special Needs Safety Harness. As with all our products, strength and durability are a priority. The parent belt closes with an American made ITW Nexus Classic buckle that has a break strength of 200 pounds. The O-ring on the parent belt is the same quality as the O-ring on the Special Needs Safety Harness (500 pound break strength weld). And the snap hooks on the tether are the same heavy duty snap hooks that we use on our Special Needs Safety harnesses; strength data is not available but they are the same heavy duty snap hooks that are used on horse tack. 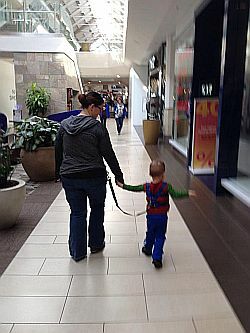 You can order your hands-free parent-to-child tether in the Accessory section of the order form. Available in black, navy blue, pacific blue, red, and purple.